I'm sure you are wondering what the "Egg Challenge" is? Well, Sharon Johnson over at No Time To Stamp? hosts a challenge every Friday. You can check out her latest Stamp Simply challenge here...The Incredible Edible Egg! I don't always get a chance to play along but no one is keeping score either. It's just a lot of fun to see what everyone comes up with. Sharon's challenges (along with many, many others) are a great source of inspiration to me! Seem like an odd card?? It makes perfect sense to me. You see, my brother-in-law's birthday is this Sunday...that's right, Easter! So, when I read Sharon's challenge, it all came together. 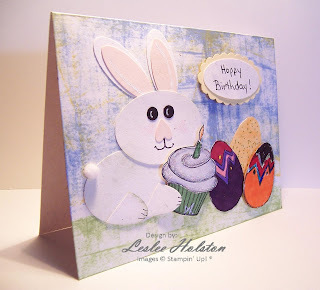 "Hoppy Birthday" and the inside reads, "May your day be Egg-ceptional!" The cupcake and the egg images are from the Wagon Full of Fun set in the Occasions Mini Catalog. Their uncle is going to love this card! Jesse and Adam colored the Easter eggs. Adam even called him to ask his favorite colors! I paper pieced the paper cupcake cup. Watercolored the frosting and added some glitter. The bunny is made of punches. It's a busy, bright card for me but the more I look at it, the more it grows on me. Thanks for another great challenge Sharon! And thanks for stopping by. Enjoy your day!